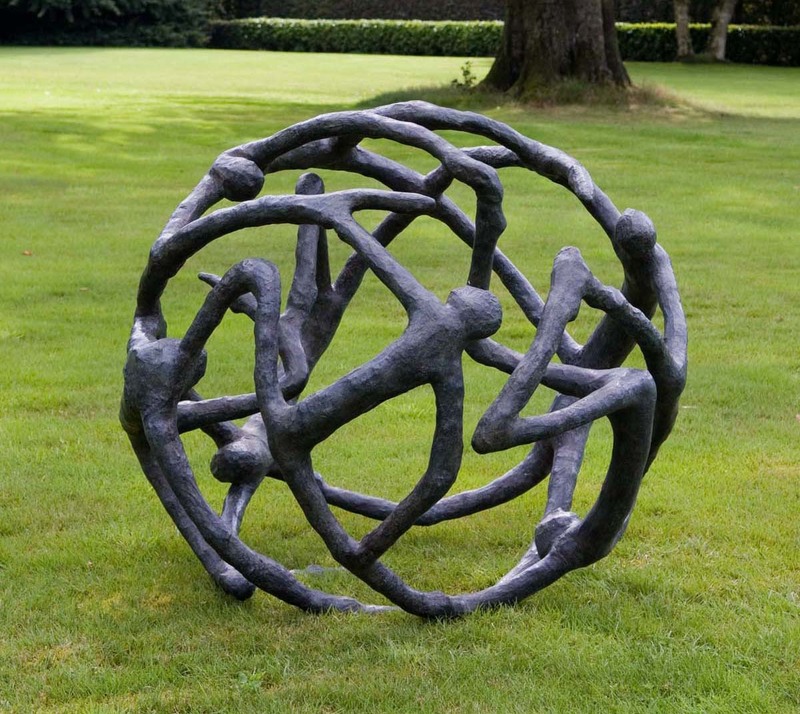 An accomplished piece by Belgium born artist Ann Vrielinck; ‘Chat’ is a beautifully crafted bronze that depicts several figures intertwined in a spherical mass that sees each figure linked and moulded to one another to form a narrative about networking and conversation. The piece is deliberately vague in its approach to the figure, using an iconic impression often used by the great Alberto Giacometti in his works to suggest figures whilst keeping the concept of identity and personalisation separated from the narrative. Possibly the most effective aspect of this piece is its use of shape to reflect a global effect, the use of the sphere so commonly approached in art to convey humanity, spacial awareness and connectivity; it has been excellently used here to respond to the idea of networking people and how conversations now are not limited to people in nearby settings but can be mapped throughout the globe to give a sense of widespread connection to fellow people. By leaving the piece as simply the figures she has created these wonderful voids in which the viewer may look through the work to the surrounding space, adding another string to the narrative of the piece already present in the bronze work. By allowing the viewer to read not only the figures but the interaction between the figures and their location provides the narrative with a setting; a context that the viewer may then read more into. Depending on the curated setting of the work the narrative can alter to suit each different location, leaving the imagination and level of interpretation in the hands of the audience. This entry was posted in and tagged Bronze Sculpture, ann vrielinck, figurative on 3rd May 2014 by Charlie.